What is Salt Lake Glucosamine Chondroitin ? Salt Lake Glucosamine Chondroitin is a joint health supplement formulated to support proper joint functions. The manufacturer claims that long-term benefits of taking this supplement will strengthen your joints, ensure continuous lubrication, minimize friction, and bring more comfort to your every movement. Stronger joints that are more resilient to damage allows for enhanced flexibility and improved range of motion. Shorter term improvements to the experience of pain and relief may also be derived from this product. Users who are specifically avoiding gluten and GMOs will find this product suitable to their preferences. 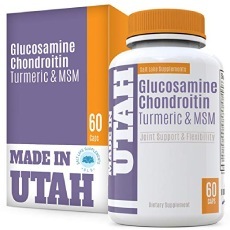 Who is the Manufacturer of Salt Lake Glucosamine Chondroitin? This product is manufactured by Salt Lake Supplements, a nutraceuticals company based in Utah, USA. The manufacturer has a broad range of product offerings intended to address a wide range of ailments and nutrient deficiencies. The company is setup as an retailer store and information about its products, including this joint supplement, are detailed on third-party sites. The products, however, are sold via other leading and reputable online reseller sites too. 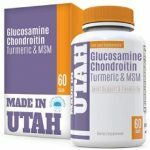 How Does Salt Lake Glucosamine Chondroitin Work? This supplement combines glucosamine, chondroitin and MSM. These compounds help facilitate faster repair and healing of damaged joints by helping your body produce higher levels of cartilage. Cartilage is vital to the quality of the joints and as the body ages, it becomes damaged and worn down. By providing the nutrients needed to repair and rebuild the cartilage, the joints become stronger and less vulnerable to the effects of aging and injury. Salt Lake Glucosamine Chondroitin Ingredients – Are they Safe & Effective? Glucosamine – It increases the rate of cartilage production which, in turn, results in healthier, stronger joints. Chondroitin Sulfate – It helps boost the body’s mechanisms for repairing cartilage and works well when combined with Glucosamine. MSM – It enables the body to convert calcium into usable forms and uses these to improve bone health. Methionine – It has a natural analgesic effect that helps alleviate pain in the joints. Quercetin – It has strong anti-inflammatory properties to reduce swelling and also provides antioxidant protection. Turmeric – It contains powerful natural antioxidants that provide joints and cartilage with added protection from free radicals which can potentially cause permanent damage to the joints. Bromelain – It is an enzyme derived from pineapples which has been commended for its ability to calm inflammation and reduce swelling. What are the Advantages of Salt Lake Glucosamine Chondroitin? This product does not contain GMOs, allergens, gluten and sugar. This product has been tested for safety, quality and potency by an independent third-party outfit. The manufacturer claims that regular supplementation with this product may redound to buildable effects which, in turn, can improve flexibility. This product contains high levels of glucosamine. What are the Disadvantages of Salt Lake Glucosamine Chondroitin? This product appears to have a very limited distribution channel which may make it inaccessible for some consumers. There are mixed reviews concerning the effectiveness of a glucosamine-chondroitin combination in improving overall joint health. This product utilizes glucosamine derived from shellfish which may cause sensitivities amont some users. This product is not completely allergen free as claimed on the official website. How Should You take Salt Lake Glucosamine Chondroitin? The recommended dosage for this supplement is 3 capsules daily. How Much Does Salt Lake Glucosamine Chondroitin Cost? A bottle containing 60 capsules $10.48, which is good to last for 20 days when taken as instructed by the manufacturer. What is Salt Lake Glucosamine Chondroitin ’s Return Policy? There is no information on the product website regarding any money back guarantee or return policy. Does Salt Lake Glucosamine Chondroitin Offer a Free Trial? There is no indication that this product is being offered for a free trial. This is yet another joint pain supplement that has invested heavily on traditional information about glucosamine, MSM and chondroitin. It contains high levels of glucosamine but very low levels of chondroitin and MSM. While there may still be basis for claims made by the manufacturer, it may be prudent to know the latest findings about the health effects of these ingredients if you are seriously considering using them to relieve joint pain. For one, the glucosamine-chondroitin combination has shown mixed results in clinical studies in promoting joint health. There are other factors to consider too, before making a decision about buying this particular product, such as the fact that there is no apparent return policy and one bottle lasts less than a month. As always, do your research before settling for any supplement and, if possible, opt for one that offers a free trial and solid money back guarantee.